We aim to dispatch all online orders within 2×24 working hours (Mon-Sat) after you place your orders. We roast every Monday, Tuesday, Wednesday and Friday. You are able to select either Standard or One Night Service shipping at check out. Your coffee may be roasted up to 48 hours prior to it being picked up by the courier. We recommend drinking our coffee between 4 to 21 days after roasting. Orders are shipped using JNE / Tiki/ Sicepat/ Gosend for food & pastry. Standard Shipping may take up to 4 business days for outside Java Island. Please check with your local post office for an estimate. Please ensure you provide a valid email address and contact number. HOW LONG DOES YOUR COFFEE LAST FROM THE TIME I PURCHASE IT? Optimal drinking time is within 4-21 days of the roast date and you’ll get more out of your coffee if you store it in a cool, dry place (not your fridge- its an urban myth). We currently roast Monday, Tuesday, Wednesday and Friday, so you have plenty of time to brew. We cannot give any form of refunds on coffee beans purchases after it has been shipped to you. We can only give product exchange if only the product is not according to what your order. CAN MY ORDER BE CHANGED OR CANCELLED? In some circumstances – yes. However, please note that we roast to order and changes made 18 -24hrs after you have placed the order may be tricky to cancel. If you need to change or cancel an order please email us order@giyanticoffeeroastery as soon as possible and don’t forget to put your order number. HOW DO YOU PACK YOUR COFFEE BEANS? We pack our coffee beans in one way valve, airtight ziplock aluminium foil bag. Prior to shipping we will wrap the coffee bag with an additional bubble wrap to avoid damage during shipment. Our main focus is taste, quality & clarity – which is ultimately the result of careful and sustainable farming practices. Although some of our coffees may be organic, we do not advertise our coffee as being so. DO YOU ALSO SERVE FOOD IN YOUR CAFES? Giyanti Coffee serve puff pastry, croissants and some traditional cakes served from 9.30-17:30 Tuesday to Saturday for all your coffee, drinks, take away food and sweet treat needs. You can view our current menu here. DO YOU TAKE BOOKINGS AT YOUR CAFES? Yes we do take bookings for large group/meetings of maximum 30 peoples in a room. Please call us directly at +62821 1000 6661 to make a reservation if you need fast response. Or you can fill our reservation form in the website. 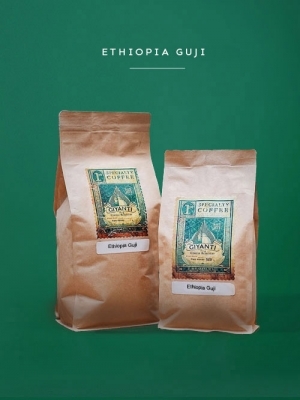 I WANT TO SERVE GIYANTI COFFEE AT MY CAFÉ / BUSINESS, HOW DO I MAKE THIS HAPPEN? CAN I WORK AT GIYANTI COFFEE?